Etching House has Desert Island in stock. 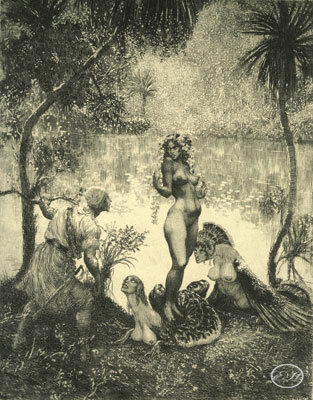 The original etching of Desert Island is extremely rare and unusual. The original of number 10 is marked as an edition of 55 but it is thought that the plate failed at 36. The central alluring female figure is Polynesian and as well as a pirate, a reptilian humanoid and harpie is included.